Is your business using Flipboard? Home → Business → Is your business using Flipboard? I have long procrastinated using Flipboard. I had many friends begin using it back in 2013. I guess it is better late than never, and even in July 2014 I feel like an early adopter over there. Many businesses are just getting the hang of sharing their things on Facebook, which is essentially the dark ages of the Internet. Many many things have been tweeted, plussed, scooped, etc since the days when businesses could get their posts to their audience on Facebook for free. I think we were still using land lines and reading newspapers back then, or maybe living in caves and running from dinosaurs, not sure! Anyways, in March 2014 Flipboard partnered with CNN and acquired Zite and it is time to start using Flipboard, especially if you have a website that produces content. 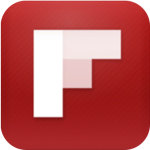 Flipboard’s sign in process allows you to use a Facebook or a Google Plus account. This is excellent news because with Google Plus, you can act as your business rather than a person. Below is a magazine that we created under our business’s name. Business owners and employees (or even customers or other helpers) can later be added as contributors. Technically, you only need to use your business once to log in and configure the magazine, and then contributors can add all the content moving forward! Flipboard can also be used for eCommerce with “shoppable magazines” aka catalogs. Flipboard can be used to curate- in other words, let’s say you follow social media news, you could start a social media Flipboard and flip all of the latest news to it from a variety of sources. Flipboard can be used simply to promote your own content as well. What does a Business’s Flipboard Magazine look like? Behind the scenes there is a simple to use editor which allows you to rearrange the articles. This is not a publication that comes out once a month; it is more of a “board” of sorts. You can easily flip through the boards using your mobile device by swiping. Your Flipboard magazine is very visual and pretty. It can even support animated GIF files. Every time you flip something it creates a new link back to your site. In Google Webmaster Tools (WMT) you will see an inbound link from flip.it. When people reflip your news into one of their curated magazines it creates another inbound flip.it link. Social signals are a factor in some search engine algorithms, and this will become increasingly important in the future of the web. Obviously, as seen above, you can embed your shiny new magazine on your website. There are many other ways to promote your magazine which I will be exploring. I will update this article at a later point in time.